Apple’s new watches are priced in a pattern unlike any of the previous pricing models for Apple products. In contrast, the watches are differentiated by size, materials and bands. There are also a total of 38 watch configurations available at launch (SKUs) and another 38 bands that can be purchased separately. The bands come in four price points and the watches in 15. Of these 15 watch prices, four are dramatically different. The pricing of the watches is shown in the two graphs below (with and without the Edition). This mix of product makes average pricing estimation more challenging, but the more pertinent question is what does this new pricing model signify? Is it something that Apple can “pull off”? Can Apple actually price not on functionality (or options thereon) but on materials? It used to be said that Apple’s profit engine was fueled by the ability to price memory at a significant mark-up on its cost. The iPod earned the vast bulk of music player profits by offering additional memory increments at significant price increments. Even today, a 64GB iPod Touch is priced $100 higher than a 16GB version. Sounds reasonable, but a quick check shows that 64GB of Flash memory probably costs about $5. This exploitation of pricing/cost differences at the margin allows for great profitability and is rooted in the ways the buyers contemplate value. Therefore the difference between memory-based pricing and materials-based pricing is only in the choice of how to attach value in the mind of the buyer. In one case it’s having the option on storage, in the other it’s having the option, perhaps, of more durability, quality or glamour. The tricky part is understanding just how much the market will bear. What is the right differential for pricing of steel vs. aluminum? Or what makes gold worth so much more? The cost of these materials (and the processes needed to manufacture them) is not very important. As with memories, the differences are not that significant. It could even be that the Aluminum process is more expensive than the steel process–it depends also on volume. What matters most is how to gauge the perception of value. This is where one can take cues from the existing market. Gold is costlier than steel but the pricing difference is greater still. Multiplying $1000 (cost) by 10 (to get a price) yields far more profit than multiplying $1 by 20. This perception of gold as being worth it is far beyond its utility–a perception which has taken centuries to build. 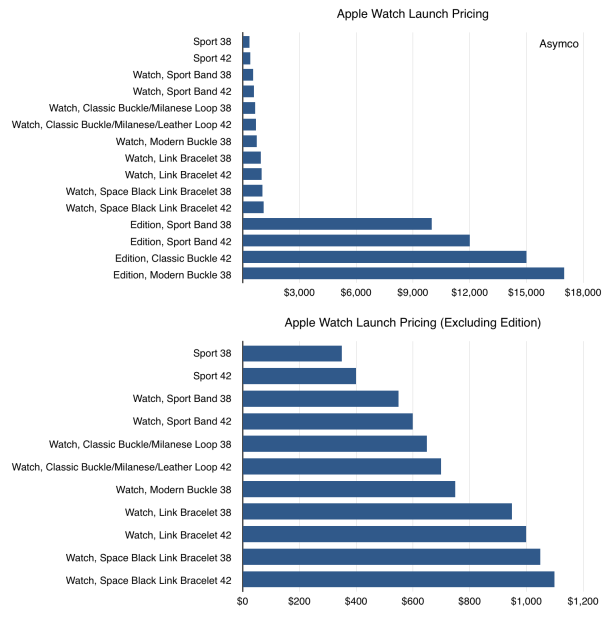 What Apple is doing with Watch pricing is simply leveraging existing perceptions of value for materials and using them to capture profits for an otherwise purely functional product. But that process of using perception to gain pricing advantage for function is how Prestige branding has always worked. The notion that materials, craftsmanship and attention to detail can be priced at huge multiples of cost is possible only with the right brand. That brand, itself built over decades, even generations, gives assurance of quality, perhaps exclusivity and comforts the purchaser in the moment of decision. It also provides assurance after the purchase and preserves the feeling of value well into the future. So-called Luxury brands are those which can impart these qualities on their products and extract the pricing advantage. Sounds great, so why doesn’t everybody do it? The answer is that it takes time and perseverance, with typically low volumes. This is not something technology brands have been able to do. Mainly because the products are perishable but also because they have not been around for long. With technology, the value is high at purchase on a functional basis but diminishes rapidly afterwards. It’s as if, in order to preserve notional brand value, a product needs to be a functional commodity, undifferentiated on what it does but differentiated on the way it does it. This is the unique value of Apple’s brand: among technological brands it can stretch to cover the perception of value for design, materials, craftsmanship and prestige. At the same time it offers new experiences and introduces new products for new jobs to be done. › Next Post How will we measure Apple’s Watch success?